Hey, Lauren! Is Apple's 17" MacBook Pro Expensive? Is 17" MacBook Pro Overpriced vs. Dell, HP, Lenovo, Sony? "Intel is now known to be launching significant updates to its notebook processor line on Monday that should be headlined by an upgrade to the processor line central to Apple's MacBook Air and Lenovo's ThinkPad X301. An update list obtained by CNET has the semiconductor company upgrading its Core 2 Duo S to include a 2.13 GHz model, the SL9600. The chip is a significant update over the previous 1.86 GHz ceiling but should still preserve an identical 17W of peak thermal power consumption, 6 MB of Level 2 cache and the 1,066 MHz system bus...."
"There's something about comparing the prices of Windows PCs and Macs that makes otherwise cool and collected people - Windows and Mac users alike - become profoundly emotional and partisan, until steam shoots out of their ears and their eyeballs turn bright red. You can see this passion crop up in some of the comments on Ed Oswald's two recent posts (here and here) on Microsoft's new 'Lauren' ad comparing 17-inch Windows laptops to the MacBook Pro. I've also encountered it every time I've tried to do the math on the Windows vs. Mac question - which I started doing within a few weeks of Technologizer's launch last summer. "...asking whether Macs are more expensive than Windows PCs is like asking whether Audis are more expensive than General Motors cars: It's a meaningless question without context, since the answer is entirely contingent on the models you choose...."
Link: Hey, Lauren! Is Apple's 17-Inch MacBook Pro Expensive? "Hot on the heels of Microsoft's line-in-the-sand advertisement for 'Lauren,' the girl who 'isn't cool enough for a Mac,' comes this laptop shootout from Technologizer pitting Apple's 17-inch MacBook Pro against similarly-equipped PCs to find out if there really is a $500 Apple tax. "In this corner, the 17-in. Apple MacBook Pro, for $2,799. "As it turns out, there is an Apple tax. And a Dell tax. And an HP tax. And a Lenovo tax...."
Link: Is Apple's New 17-in. MacBook Pro Overpriced vs. Dell, HP, Lenovo, Sony? "From touchy trackpads to balking batteries, Apple's portable computers (the MacBook, MacBook Pro and MacBook Air) are vulnerable to certain problems not shared by their desktop siblings. If you have an Apple laptop that's giving you grief, here's how to fix the most common woes." "It's difficult to imagine life without our laptops. And in these credit-crunched times, there's all the more reason to make them last longer and work better. "We've asked our experts to give us their top tips on how to de-stress your system and make your laptop live a longer, happier life...."
"It's not easy keeping a computer up to date. "Aside from all the hardware issues you might have during the usable life of a laptop or desktop machine, there are software updates - at the operating-system level as well as with applications to keep up with. "One of my ongoing projects is keeping our 2003 Apple iBook in working condition. "Over the past few years, that has meant adding a wireless-networking module ($40 on eBay and fairly easy to do), stuffing an additional gigabyte of memory ($30 at Fry's and also relatively easy) under the keyboard (yep, that's where it goes) and replacing a dying hard drive ($60 at Fry's)...."
"It will cost you an arm and a leg, but Apple is now offering an official 8 GB memory upgrade kit for the mid- and high-end models of its current 15-inch unibody MacBook Pro family, AppleInsider has discovered. "The kit containing a pair of 4 GB 1066 MHz DDR3 SO-DIMMs is available immediately for a whopping $1200, or nearly the price of the company's entry-level 13-inch unibody MacBook...."
"Orange, a provider of mobile phones, mobile broadband and home broadband, will sell Apple laptops on its network from the summer, according to a UK mobile phone industry source. "Mobile Today magazine, reports that Orange will be the first company to subsidise Apple s laptops with a mobile broadband, similar to those offered by Carphone Warehouse and others...."
"The operating system installed on MacBook Pro (17-inch, Early 2009) computers should be Mac OS X v10.5.6 or later, with a minimum build of 9G2141 or higher. Running an older version of the operating system with less than a minimum build level of 9G2141 will cause the display to appear less bright. "Resolution: Installing the latest version of the operating system will return the display to its normal brightness levels...."
"A new incarnation of lithium-ion batteries based on solid polymers is in the works. Berkeley, CA-based startup Seeo, Inc. says its lithium-ion cells will be safer, longer-lasting, lighter, and cheaper than current batteries. Seeo's batteries use thin films of polymer as the electrolyte and high-energy-density, light-weight electrodes. Lawrence Berkeley National Laboratory is now making and testing cells designed by the University of California, Berkeley spinoff." PR: New PC Gadgets has released their new Laptop Flip stand for Mac laptops. 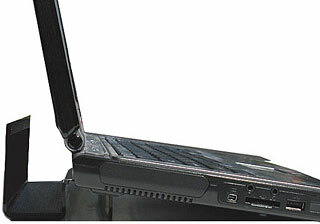 Raising your laptop increases ventilation and reduces heat. 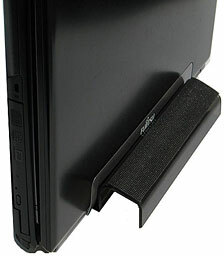 The Laptop Flip raises the back of your laptop 1" creating a better working angle, and also lets you store your 'Book in the vertical position when not in use creating additional space on your desktop. Laptop Flip is made from lightweight acrylic, and easily stores in your laptop bag. Small enough to carry in your laptop bag. PR: Monoprice delivers cost effective solution for adapting your new Mini-DisplayPort equipped laptop to your current display. Mini-DisplayPort is a miniaturized version of DisplayPort, the newest digital display interface developed by the Video Electronics Standards Association (VESA). 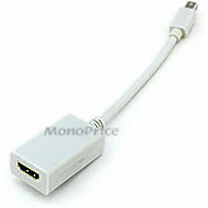 Monoprice have a collection of Mini-DP adapters that will allow you to connect your new laptop to the widely used current standards of VGA, DVI or HDMI. Max Supported Resolution - 1920 x 1080p, 12 bits/channel or 12*3 = 36 bits on all channels. NOTE: This adapter will support audio only if your source device allows audio output through the Mini DisplayPorts interface. If you're not sure, please check with the manufacturer or website, to confirm if your device allows audio out through the Mini-DP interface. PR: GainSaver, an online reseller of used Macintosh computers announced today its Recession Buster Sale, which gives price-conscious consumers an additional 10% off all used Macintosh MacBook notebooks in stock. GainSaver, an online reseller of Certified Preowned Macintosh computers announced today the launch of its latest sale of used Macintosh computers: the Recession Buster Sale. This promotion gives GainSaver customers an additional 10% off all MacBook Pro notebooks. "We want to make the Mac affordable for everyone," said Steve Harper, director of sales at GainSaver. "The MacBook Pro is the favorite of business users, designers and students. These groups are especially hard hit by the current economic situation, but they still need a Mac to get their work done. We are backing them up with low prices and a 100% satisfaction guarantee." At the time of purchase, shoppers at the GainSaver website can customize their MacBook computer to their own requirements. Integrated into the company's online shopping cart, the Configurator lets shoppers select just the components they need from a range of hard drives, optical drives, software programs and memory options. All components are installed and tested before shipping at no extra charge. For best selection, GainSaver is recommending that customers order now. Recession Buster pricing will continue on all MacBook models only while supplies last. PR: If you own two computers with separate screens you can use ScreenRecycler. Even your laptop can be used as a second screen for your main machine. Recycle your old iMac, PowerBook, or even Windows PC. There no such thing as enough screen real estate. Use your old iMac as second screen for your new iMac like on the picture above. Use your notebook as additional screen when you place it beside your desktop Mac. If you own two computers with separate screens you can use ScreenRecycler. Even your laptop can be used as second screen for your main machine. Mac OS X on Windows PC's ? - For sure ! Many Mac users have a second computer sitting right next to their main computer on their desk including a nice display. ScreenRecycler now enables you to use this spare computer as second display for your Mac. You can even use an old Windows PC for that purpose. Targeted to all users with two computers to extend screen real estate. It's like a dual monitor setup without the need to buy an additional monitor. Use any machine as additional monitor on your Mac. Added iPhone and Netbook resolutions and double resolutions (2 x 1024 x 768,2 x 1280 x 1024) to the driver. As the old driver is compatible (just added those resolutions) you do not see a driver upgrade panel. If you want the new resolutions install the driver. It's located inside the application bundle. Internal cleanup of code, fixed possible bug introduced in the last version. A good selection of old-school MacBooks this week, plus a full slate of refurb Unibodies, save for the 17-incher.